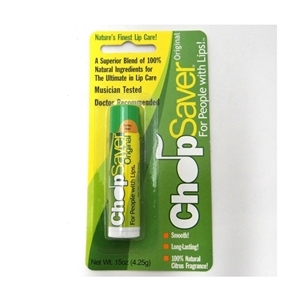 ChopSaver is, quite simply, the best lip balm on the planet! It was originally created for musicians - people who use and abuse their lips on a daily basis. ChopSaver Original is 100% all natural. It combines the goodness of herbs with nature's finest oils and moisturizers like shea butter, mango butter, avocado oil and aloe. Kissed with the essential oils of citrus, ChopSaver soothes your lips like no other product on the market, whether you are a musician or not. It's so good, dermatologists are now recommending it to their patients. ChopSaver - Musician Tested, Doctor Recommended!